I went for a long walk along the beach at Courtown, Co. Wexford as part of my recuperation following a week of sneezing, coughing and everything else that goes with the common cold. This painting is a bit bigger than my usual, measuring 16″ x 20″ and also took a bit longer than my usual 2 hours, 4 hours in fact. From the outset, the large featureless areas, like the calm sea, the flat beach, would need to be a complex series of colours and shapes to weave an interesting surface. This is a personal preference, I cannot tolerate the monotony of a single layer of colour. By applying layers and not completely covering the previous layer adds this complexity. It means a particular area of the painting must be built up relative to other areas. The clouds were finished relative to the final shape and colours of the waves. As there are only 3 colours used, Yellow Ochre, Burnt Sienna and Prussian Blue, the process is a bit tedious but the final harmony is worth it. I have not suggested the scale within this landscape. The trees on the cliff top are no help – they could be any size. I was going to put the usual couple walking at the waters edge in the middle distance, but I thought I could get it to work without this visual cliché. So now the viewer could be standing on the cliff overlooking the panoramic view or standing on the beach about to walk into the sunlight. I will post the video, possibly in 2 parts, in a few days. See you then. 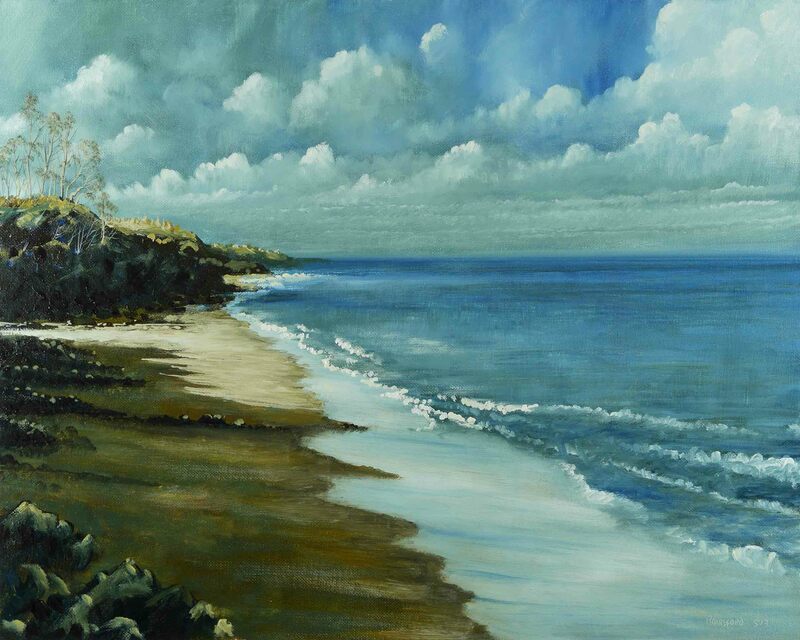 This entry was posted in Oil Painting and tagged Alkyd, Art, beach, Clouds, Culture, Education, Inspiration, Irish landscape, Medium, Oil Painting, Oil Painting Instruction, Oil Painting Landscape, painting, Pictures, Sea Scape, Sky, Trees, Water, waves. Bookmark the permalink. beautiful, i can’t believe how quickly you paint! Thank you. I’m using Alkyd quick drying oil colours. This means the colours begin to set as I paint. Great for overpainting in a single session. Also I used only 3 colours and this makes the job of mixing faster – less choices. Thanks Eithne. Its still a lovely place. I too have found that the simplest compositions are often the most time-consuming to pull off correctly. You ‘ve certainly done that very well. You’re right. Those large empty spaces are always a challenge. Thank you. lovely painting and yes the wonderful atmosphere you created invites to be part of the scene, if it would be warm enough, I think I went for a swim…… marvelous! I think I got into the habit of working like this from the years I spent preparing Litho printing plates. In those pre-digital times an image had to be broken down into as few colours as possible to reduce the number of printing passes. These limited colours would be overlaid to produce as many new combinations as possible. Old habits die hard. Thank you again. Ah yes, I do that with my printmaking. Thank you Elizabeth. Its a nice change for me. The nearest coast is about 40 miles from where I live so seascape is an occasional adventure. Excellent work! I am very glad you stopped by my site! Thank you. I love your technical information. Thank you for liking my post! I really like this painting…especially the water. Brings back memories of the ocean for me!